Murderer of Ari Fuld says he went to Hevron holy site but could not get in to commit attack, hid knife in bathroom before murder. The teenage terrorist who murdered Ari Fuld yesterday had planned to carry out a separate attack at the Tomb of the Patriarchs in Hevron, News 2 reported. 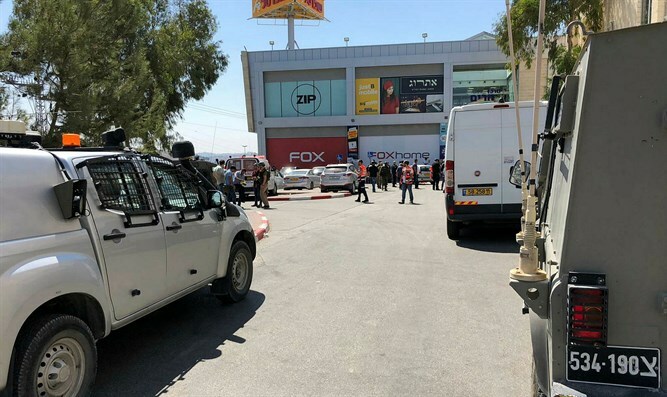 Security forces are investigating Halil Jabarin, the 17-year-old Arab resident of Yatta, near Hevron, who stabbed Fuld to death at the Gush Etzion Junction Sunday morning. Jabarin was shot by Fuld and another civilian and is currently being treated at Hadassah Ein Kerem Medical Center in Jerusalem in light condition. According to preliminary reports published Monday evening, Jabarin admitted that he had originally sought to carry out a stabbing attack at the Cave of the Patriarchs, one of the holiest sites in Judaism. He had gone to the site on Friday with his knife, but was unable to enter the building and returned home. In addition, an investigation into the attack found that the terrorist arrived at the junction at 1 Am Sunday morning with a knife in his backpack. He hid the knife in a bathroom cubicle on the second floor of the Rami Levy supermarket branch. Then he left with the knife not on his person. During his wanderings there, he aroused the suspicion of two security guards. They searched him - but they found nothing and released him. The terrorist returned to the bathroom, took out the knife, and waited for long minutes in the course of which many other people passed by. Then, when Ari Fuld turned his back on him, he took out the knife and stabbed him. On Sunday, Jabarin's family stated that they had warned Palestinian Authority security forces that their son had intended to commit a stabbing attack by the Cave of the Patriarchs.